So in part one of this entry I wrote about how God has wired my heart. He has placed a dream within the depths of my soul where I long to see women share one another’s brokenness , as we point our hearts toward Jesus, and learn to walk in His beautiful love . It’s kind of a cool story …. Click this link to check it out. And now I get to share with you exactly what God is doing to make that dream come true ! Yay ! In January , I will be joining a team of passionate , driven , loving women on a trip that is called a Kingdom Journey, where we seek to see His Kingdom here on earth . We will be working with various ministry partners around the world who seek to see women rise above their circumstances to walk in the freedom of Christ . As we work with each organization, we will be implementing the “Beauty for Ashes” movement . Beauty for Ashes will see us take women away from their everyday lives in order to bring restoration and healing through the gospel message, and the romancing of the Holy Spirit. As we walk the women through a three day retreat , they will learn that their stories matter, and that a loving God wants them to put on their true identifies as daughters of the King . We will worship , study what scripture says about being a new creation , talk , laugh, cry and pray . And our greatest hope is , as each woman leaves a Beauty for Ashes retreat, she will know that she matters to our loving God. But we won’t stop there ! We know that true sustainable change requires follow up, and so we will help implement a post retreat plan , working with ministries that are in these women’s lives for the long term and helping mentor for the remaining two months that we are in a specific location. The Kingdom Journeys will have the honor of serving these beautiful women who the world often deems unworthy or unimportant. Some of the women we will work with come from such broken backgrounds ….having had their innocence shattered way too early . But I am confident as we create the space … The Holy Spirit will romance and pursue each one of His daughters. I know we are going where He is already leading. So where will all this be happening ? Our tentative route is Guatemala, Thailand , and the Philippines, but that could change through the planning process 🙂 I’ll keep ya posted ! I am often blown away by the subtleties of our God. At the beginning of the year I declared Isaiah 61 to be my personal passage of scripture as I learned to walk in His freedom more deeply. Then, my roommate even shared a song with me as God put it on her heart. Guess what it’s called ?? 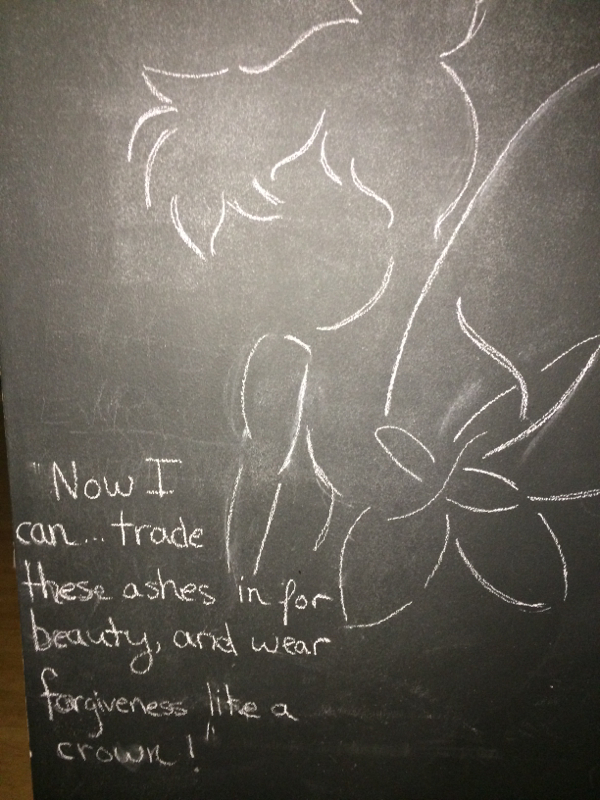 And in case that wasn’t enough… check out what we have had written on our chalkboard wall for the past 8 months or so …. Yup …. Tinkerbell and Jesus . I am so thankful and in awe of all He is doing. I am asking and praying that you will want to partner with me through prayer and financial support. This really is God’s dream and I cannot do it alone. Please click here to make a financial donation.